If you are a social media junkie like me, then you probably share as many photos of your kids, yourself, your day, your dog, your vacations and more as I do. Typically these are meant for friends and family to view and enjoy, but what if you could help a newborn thrive, or a help protect a child from a sports injury or help restore a public park while sharing your photo? Johnson & Johnson’s Donate a Photo does just that. 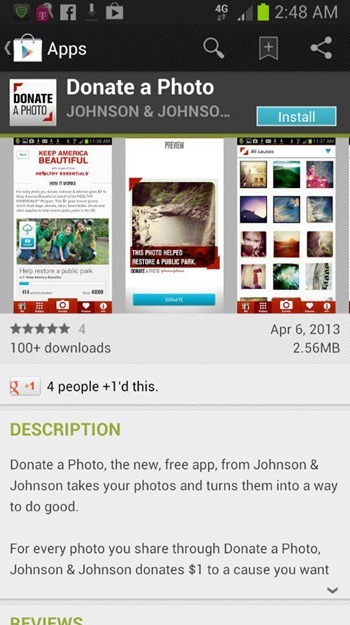 It is the app that turns photos into a way to do good. 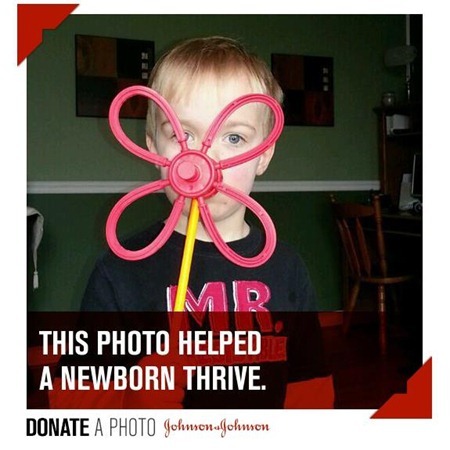 For every photo shared through the app, J&J will donate $1* to a cause that people care about. All donations are measured in actions, from planting trees to feeding families to providing medicine for children in need. Donating is simple: Just download the free Donate a Photo app from your mobile device (ios and android) and register to get started, then choose a cause, upload a photo and share it on Facebook and Twitter to let friends and followers know how they can help, too. You can share one photo a day, every day, to contribute to the causes that matter most to you. Keep America Beautiful: One photo helps restore a community park. 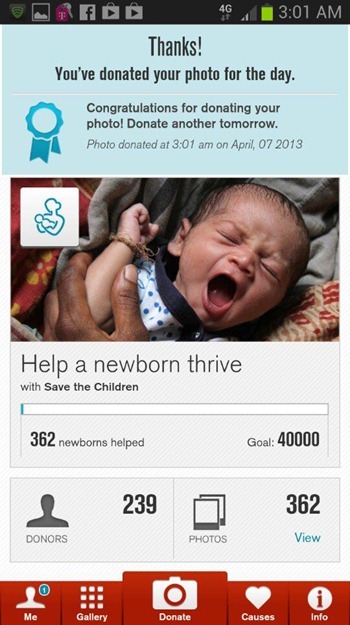 Save the Children: One photo helps a newborn get medicine to thrive. Safe Kids: One photo protects seven children from a preventable sports injury. The Healthy Essentials™ coupon book will appear in local newspapers across the country on Sunday, April 7, 2013 will provide over $50 in savings on the Johnson & Johnson Family of Consumer Companies products including NEUTROGENA®, BAND-AID® Brand, LISTERINE®, AVEENO®, NEOSPORIN®, VISINE® and others. Coupons will also be available online at www.healthyessentials.com. 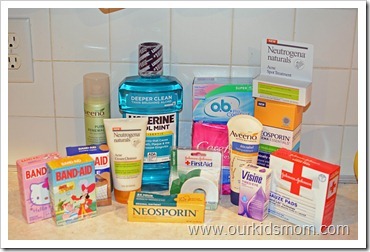 ONE OurKidsMom reader is going to win a box of assorted Johnson & Johnson products similar to the box I received! No purchase necessary. Open to legal residents of the fifty (50) United States and District of Columbia, Eighteen (18) years of age or older. Sweepstakes end April 24, 2013. Prize(s) provided by Johnson & Johnson Consumer Products Company Division of Johnson & Johnson Consumer Companies, Inc. Void where prohibited. This giveaway ends at 11:59 PM EST on April 24, 2013. Disclosure: This post on making a difference in the world through your own photography is brought to you by Johnson & Johnson and The Motherhood, who sent me a box of products and compensated me for my time. Opinions, experiences and photos shared here are all my own, and I hope you enjoy them. I want listerine to come in gallon jugs. I didn’t know they made spendla and visine. I love the Baby Washes. Love the JJ baby oil and lotion, perfect for dry skin! I like that Johnson & Johnson and its many operating companies support community-based programs that improve health and well-being. Our family has been using Johnsons Baby Shampoo for many many years and I love it! Visited the site and really like how much they support the community : Johnson & Johnson and its many operating companies support community-based programs that improve health and well-being. Our community partners show us where our giving can help the most. I learned that J&J supports programs for women and children who struggle to survive in places with limited health care, education or social support. My granddaughter has very sensitive skin & eczema, I would like to try the AVEENO® Baby ORGANIC HARVEST™ Lotion to keep her skin moist. MORNING BURST® Facial Scrub is what I’d like to try! I would like to try Aveeno Positively Radiant Daily Moisturizer Broad Spectrum SPF 30. I love the smell of Johnson & Johnson Baby Lotion! Their worldwide headquarters is in New Brunswick, New Jersey, USA. I did not know that they partner with respected groups to build the skills of people who serve community health needs, primarily through education. I learned the Johnson & Johnson is the world’s largest health care company. I learned that there are a lot of recent Aveeno products on the market. J & J “produces a broad range of innovative products used primarily by health care professionals in the fields of orthopaedics, neurovascular surgery, vision care, diabetes care, infection prevention, diagnostics, cardiovascular disease, sports medicine, and aesthetics.” Nice to know! I didn’t know Aveeno was a J&J product! I love their lotion! I like their Men’s 3-in-1 Fragrance Free Lotion for my husband. We love Band-aid brand bandaids!